We would love to hear from you! Click below to write a review. Every time I feel tight or injure myself Gina helps me work it out! Whether it’s one quick stretching session or multiple with advice on things to do at home I always leave feeling better and more prepared to care for my body. I love Gina and will always think of her first! I recommend a stretching session for anyone dealing with any tightness or injury. - Ashley E.
If you’re reading this book an appointment with Gina for stretching right now! - Tessie T.
Gina is amazing! She has me doing things I didn't think I could do. I'm excited about exercising because of her! 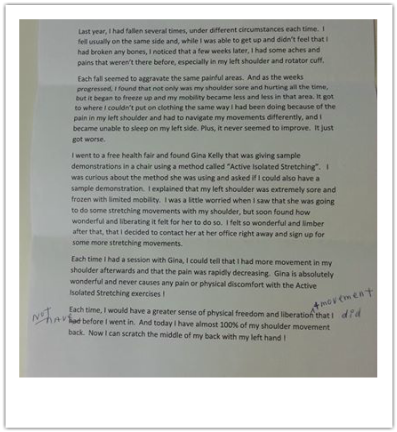 - Liz L.
​Gina has helped me regain stamina, strength and overall better health! 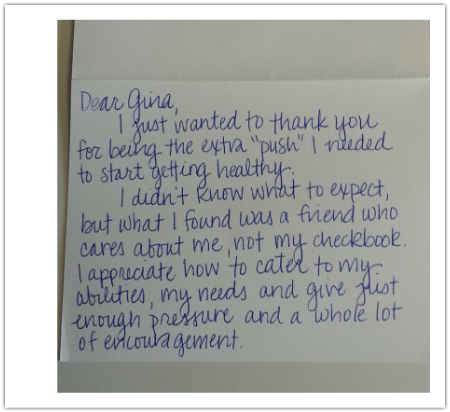 Gina loves what she does and truly cares for each client. Gina is friendly, knowledgeable and professional! - Carol Ann M.